Welcome to the site of the nursery «Elegant» . 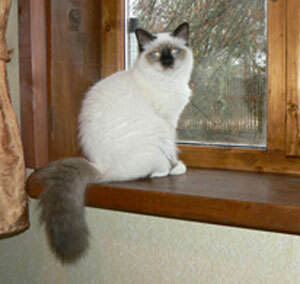 The cats of breed Sacred Birman. My name is Lena Yatsenko. There always lived cats and dogs in our family. Cats were not purebred and were picked up in the street, but they are not worse then thoroughbred ones at all. I always liked cats Siamese colour with blue eyes. But it would be desirable, that this kitten would be fluffy. It seems to me, that fluffy cats create special cosines in the house. And that is why I dreamed of such a cat. 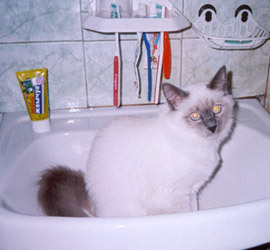 When I have seen the Birmu the first time, I have understood that I have seen my dream - fluffy blue-eyed cat Siamese color, moreover with white paws and silky wool. I have been fascinated and have fallen in love with these cats at first sight. 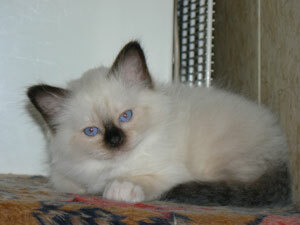 After a while in our family the small kitty blue-point colored Assilia Solnyshko, and just Asya at home, has appeared. Our Asenka is gentle, kind, lovely, modest, wise and all understanding cat. Asya has got a remarkable character. I am very glad, when exposing her at exhibitions, experts start to admire with her big expressive eyes and also her gentleness and loveliness. We gently name her "a little motor", because she likes to hum very much, especially in a lap. And the same children are born at her. 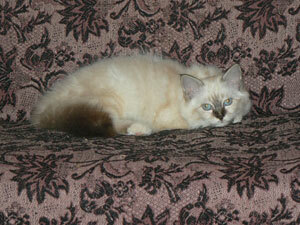 Our second kitty is Zeya Elegant, blue-point colored, ours Zeenka is our Asya's daughter. We just could not leave her. She is as kind and gentle, as her lovely mum. But she differs from her mum, because she likes to talk. Not to shout absurdly or to demand a meal, but to talk to different shades of a timbre of a gentle and melodious voice, looking directly in eyes. Zeya is very curious. She wants to know everything, it is impossible to do anything without her. Our "state quality control". And if the daughter gets the ringlets and hairpins or starts to make something from beads, her delight does not have a limit. She is our "tail", which always and everywhere near us if she does not sleep. And besides Zeya is «a little ostrich». When she does something bad, she runs and hides her head under the small bench. It looks so lovely, that it would be desirable to caress her, instead of to abuse. Our cats are excellent hunters. They showed us their extraction not once, which we let off then, to their amazement. We love our cats and their kids very much. We waited and searched for a kitten for a long time - a good modern type, show - quality. And at last, to our surprise, a remarkable cat arrived from France- Berlioz des Lutins d'Iris, sil-point colored. At home he is simply Berlioz. 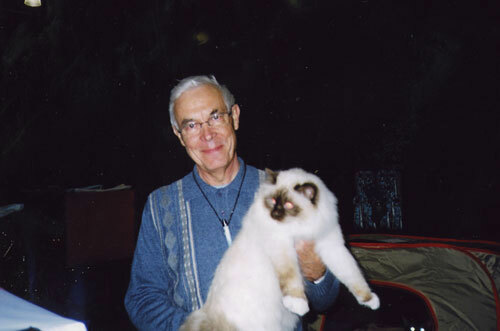 I am very grateful to the factory owners of the French nursery " Lutins d'Iris " breeds of cats sacred birman to madam Nicole Lacherade and MisterGuy Lasherade, that they have agreed to sell us such a remarkable animal. Berlioz is a very beautiful and harmonious cat with very bright dark blue eyes, remarkable white marks on paws and amazing silky coat. And doubly it is pleasant for us, that Berlioz is a very gentle, tender and kind cat with remarkable character. Such a tender animal can grow only in family loving him very much. He has fascinated all of us his tenderness! And all of us have fallen in love with him because it is impossible not to love such a nice cat. Berlioz likes to speak, he is a very curious cat, and everything is interesting to him. He adores catching a computer mousy on the screen of the monitor, thus issuing interesting clicking sounds. Berlioz likes to lie down in a lap very much. This is simply a fluffy miracle! Berlioz has already begun the exhibition career from France. Madame Nicole Lacherade exposed him at the exhibitions and it was very successful. And also I would like to say some words about people who have helped Berlioz to appear in our family. I am very grateful to Marina Litvina - the chairwoman of our club «RosKosh», for the huge help which she rendered to us. For her patience and support during long time while we searched for a kitten. Because I wanted not just a cat, but an animal of a very good modern type. An animal of show - qualities, he to be the best! 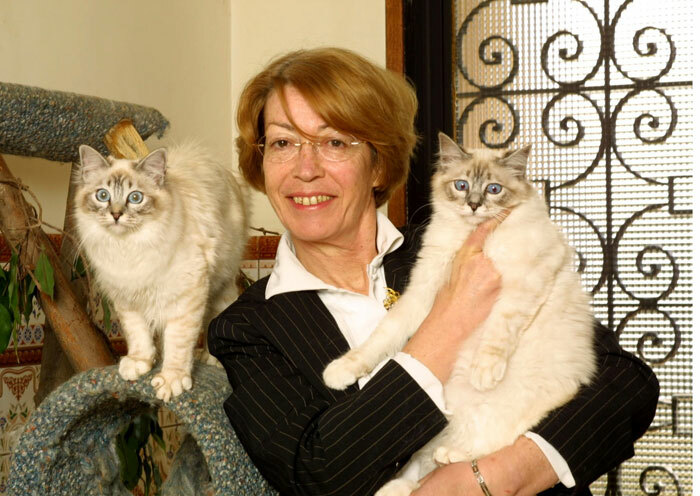 I am also very grateful for the help to the France expert Catherine Bestride and France expert on system TICA and the worker of cats sacred Burma - Genevieve Beguine, due to their help we have got acquainted with madam Nicole and mister Guy Lacerate and in our family the small, blue-eyed, fluffy, tender miracle has appeared! Having taken a remarkable cat from France, we have not calmed down on it. Our dream was to get a very good kitty. And our dream was carried out. A small charming princess has arrived to us from France. 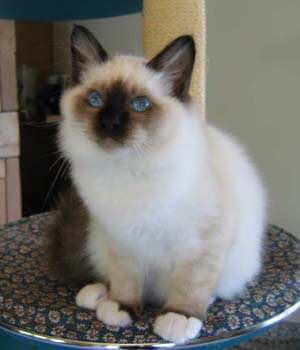 She has the true French name - Channel and she has seal point color. 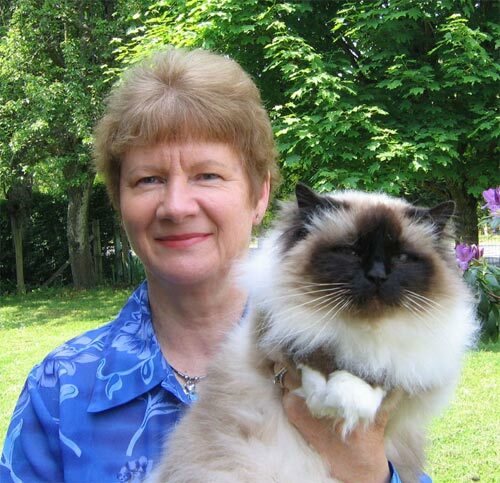 We are very grateful to the expert on system TICA and the breeder of nursery "Moulin’s de Busset", who grows the cats of breed sacred birman, madam Genevieve Basquin , because she has agreed to sell us such a magnificent kitty. Channel is the charming, beautiful, harmonious kitty with the gentlest character! We are fascinated to her, as well as to Berlioz. Channel is the kitty of a very good modern type. And we wanted it so much! She has amazing, bright, dark blue colored eyes. (It often does not suffice to Birman.) She has remarkable silky Birme coat from which it is impossible to come off. And also she has remarkable white marks on paws. Channel is very gentle! When I iron her, kiss, she licks me and hums in the answer. Such a small, fluffy, gentle beauty has arrived to us! Channel, as well as all the kittens, is very curious and likes to play. She likes to talk gently. She is similar to Zeya. We are very glad that our cats have well accepted this kitten and have quickly found a common language with her. Channel does not allow them to sleep long. It is very interesting to observe, how they play and communicate. From each of the senior cats Channel plays in her own way. With Asya it is gentler and it is tender. With Zeya they rush one after another. And on Berlioz Channel simply jumps and cannot come off his tail. Channel likes to sit at a computer and to look very much. When somebody turns on a computer, Channel is already here as here. We have decided to give ourselves a gift and to us from Italy there has arrived the remarkable small fluffy beauty seal - tebbi point with the Italian name of Romina. Romina has arrived to us from nursery Myrabirmans of our friends - Miroslavy and Karlo Karetski.We are very grateful to Miroslave and Karlo that they have entrusted us a small fluffy miracle. Romina very gentle and tender girl, with remarkable character which likes to be arranged cozy in a lap and on-hum. It very easily also has quickly made friends with our cats. Romina has remarkable type with very good head, remarkable skeleton and fine dense silky coat. We are very glad that such remarkable kitty has arrived to us. It is the present gift for an anniversary of our nursery. Chanel and Berlioz have presented to us a kitten whom we have decided to leave in the nursery. She is a small kitty color seal point. It has all better qualities of the parents since pedigree qualities and finishing remarkable character. Shelly has remarkable type with a good roundish head, silky coat, remarkable white marks and good skeleton. Shelly likes to lie in a lap and to hum. Only you will look , and it already hums. Romina became it’s best friend. Romina is very gentle and careful. We name Rominu the second mum for Shelly. They always together. And it pleases us. We are very glad, that all our cats are amicable among themselves. We are happy, that we have got acquainted with such remarkable people, as madam Nicole, mister Guy and madam Genevieve. They are always ready to help and not only an advice. When we took Berlioz, we have asked to help madam Nicole to find us the same good girl, as Berlioz. And madam Nicole has magnanimously agreed. We appreciate it very much. 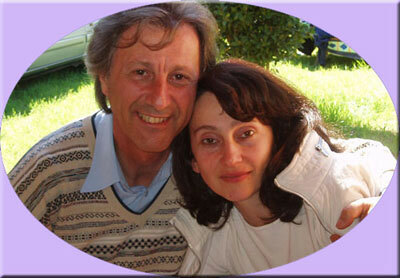 Thanking to madam Nicole, now at our place runs another blue-eyed miracle Channel. Nurseries Lutins d ` Iris and Moulin’s de Busset are one of the leading nurseries of sacred Burma not only in France, but also in all Europe. Nicole and Genevieve are the members of ANABI. We are proud, that we have pets from these nurseries. I like, when the kittens are born. The birth of a new life is so perfectly, despite of all experiences and excitements which precede this miracle. I like to potter with kittens, to accustom them to meal, to look, how they grow. And all this time you try to not think about that day when I will have to leave small treasures. But it is inevitable to have all the kittens. I am convinced, that if the kittens live in the family loving them and where since the earliest childhood they are surrounded with love, attention and care, they are taken on hands, play with them, never will grow gloomy, an unsociable kitten. It is necessary just to love them. It is not indifferent for us in what house we give our kittens. I always try as it is possible to keep in touch with new owners of our pets longer. I have understood that this is mine. So my nursery «Elegant» (elegant cats) has appeared. The nursery is registered in KLK "RosKosh". The primary goal of nursery is the birth healthy and cheerful kittens with the counterbalanced mentality. And, certainly, to improve type of animals that the kittens corresponds to the standard of breed. Birma submits me the beauty, grace, elegance, mind, the remarkable character. They are very harmonious cats. I think if to aspire to perfection, to search for a golden mean, Sacred Birma it is possible to name that this is the golden mean of which we dream so much. All the cats are charming and fine, whether it be a thoroughbred animal or the most usual not purebred kitten. Each of us chooses an animal as desirable. I am happy, that I have found for myself these remarkable and surprising cats with dark blue, as if sapphires, eyes which beauty it is impossible to admire. I hope, stay on pages of my nursery will be pleasant and interesting for you.